A parasitoid Cotesia congregata wasp attacks a Manduca sexta larva. What was the connection between the bizarre blue landscape and the string of nucleotides? Points are awarded as follows: 6 to Kojun, who answered first with a partial answer; 2 to FormicidaeFantasy for picking up on the virus and the species name; and 5 to Dani for the first complete response. Wasp polydnaviruses are one of those head-scratching biological phenomena that make me wonder about the nature of life itself. Many wasps have, as part of their genome, stretches of virus-like genes encoded in their own DNA. These polydnavirus sequences appear to show a relationship to free-living nudivirus. That is, they look like real viruses, and the association is almost certainly the result of an ancient fusion between a free nudivirus and an insect. When a wasp lays an egg in a caterpillar it injects quantities of polydnavirus. Once in the host, the wasp’s virus sets to work like a regular virus to disable the host’s immune system. In essence, the wasp deploys an offensive virus to clear the way for her offspring. 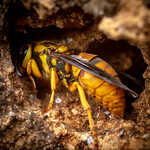 It is as though the wasp is more than just an animal. It is, instead, a wasp/virus hybrid, allowing the wasp to keep its young safe and providing the virus with a set of wings. Just curious what aspect of this “biological phenomena that make me wonder about the nature of life itself” . I see this as part of the continuum of things like mitochondrial origins, mimicry, zombie fungus, parasite-evolution in general, insect-plant coevolution, plant chemical warfare, and other coevolutionary aspects of life. Yep, that ‘Tangled Bank’ is beyond credulity. I wonder if the polyphenol oxidases in the insect immune system aren’t borrow from the plants they feed on? Wouldn’t surprise me. 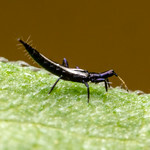 I seem to remember a fairly recent paper on aphids acquiring carotenoids from plants. On the negative side, all of this, and other complicated genetic networking, does make me wonder how far molecular phylogenic approaches can unravel the history of life. likely farther than we think right now. since we share roughly 50% of our genetics with bananas, I would not be surprised if we rolled it all out back to close to multicellular life’s beginnings. it’s just beginning days still. Gosh, I heard that humans have bits of virus all over the place but I never thought of a wasp actually using them. That’s amazing.